The laboratory of the experimental scientist, Joseph Priestley, who worked here from 1773-1780 can be seen at Bowood House , the home of the Marquis of Lansdowne. (Open Apr-Sep. 11.00-18.00) It was here on 1st August 1774 that Priestley isolated the gas subsequently recognised as oxygen. Later the laboratory was used by John Ingen-Housz (d.1799) who discovered photosynthesis and was an exponent of variolation against smallpox. Ingen-Housz died in 1799 and was buried in a vault in St Mary's Church, Calne. Priestley's Pool. It was here that Priestley collected gases bubbling naturally from the bottom of the pool for analytical experiments. Parnella House, 23, Market Square. 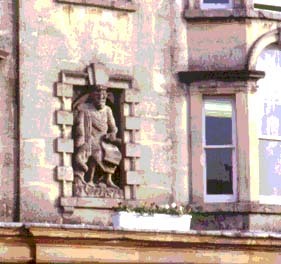 The exterior elevation of this 18th century doctor's house in the market square has a statue of Asculapius on the front. It was occupied in 1825 by a local surgeon, W. Clare. Birth place of Thomas Willis, the seventeenth century Oxford physician. The little cottage in which he was born in 1611 still stands. There is no commemorative plaque and the house can only be viewed from the exterior. A spring discovered in 1815 launched the town as a spa buts its popularity was short-lived, eclipsed by the proximity of Bath. The only remaining evidence of its former success is a line of Georgian villas seen on the right as one approaches the town from the direction of Devizes. The village pub was once a rendezvous for travelling veterinary surgeons which is how it acquired the name Bleeding Horse. Amongst the many exhibits at the museum in Cathedral Close is a reconstruction of a GP's surgery - a consulting room and waiting room from the 1940's complete with wax-work figures (right). The surgery originated in Wiltshire town of Amesbury and belonged to Dr Philip Neighbour. It was located in a coach house to the rear of his home. Surprisingly, the consulting room lacks a desk and chair for the doctor who is resting himself against an examination couch whilst interviewing his patient. (Opening hours: Oct-Mar 10am-4pm. (weekdays) Other months: 10am - 5pm.(weekdays). Sundays in July and August: 2pm - 5pm. The shrine of St Osmund (d. 1099) can be found under the eighth arch of the south aisle of the cathedral . Here is another example of healing holes (q.v. 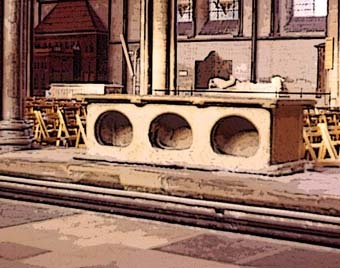 St Albans and Whitchurch Canonicorum) whereby diseased persons could expose themselves to the healing power thought to emanate from the saintly remains contained within a casket known as a feretrum which was placed on top. The structure originally stood at the east end of the cathedral but was thrown out during the Reformation and used as a tomb for Lord Stourton who was hanged for murder in Salisbury market place in 1556. In Fisherton Street, the Infirmary (1767-71) by John Wood the Younger of Bath (right) survives though the original brick four storey building was much enlarged in the 19th and 20th centuries. The GWR Medical Fund Hospital, now a community centre, was opened in 1872 for accommodating sick railway workers and, in 1892, it amalgamated with the company's welfare services in a building on the corner of Faringdon Street and Milton Road to form an early polyclinic, or medical centre which provided eight consulting rooms, a dispensary, a dental surgery, an ophthalmic clinic and ENT department together with physiotherapists and chiropodists. Early in the present century, the centre was equipped with an X-ray apparatus. Three plague graves in a field about one mile from the village. Two men died of plague during an outbreak in the mid-seventeenth century and were buried by a friend who is reputed to have dug a third grave for himself in which he was buried when he subsequently succumbed to the infection.. It is not possible to view them at present because they are in the middle of a pig farm.